In addition to opening up the game's simulation, Interactive Surfaces also permit us to incorporate narrative elements into the interactive experience in ways that alleviate the fundamental conflict between narrative constraints and the responsiveness needed for interactivity. Narrative is structured disclosure. Narrative in games is spatialized disclosure. Game designers structure game space to sequence disclosure. In first approximation, information is located in game space, and the order in which we traverse these spaces defines the order in which information is disclosed to us. But the means of disclosure - just how we turn information into entities we can place - is a separate issue. Myst and System Shock 2 are milestones of what I call forensic gameplay - information disclosure following a fictional event, from read-only audio logs, archived e-mail and fictional research reports. Forensic storytelling shifts the emphasis from story, which is inherently at odds with interactive self-expression, to backstory. The problem with this indirection is that information retrieval is often still a passive and tedious affair - the narrative is spoon-fed (or, with DOOM3, force-fed) to the player. Unlike cut-scenes or talkative messenger NPCs, Interactive Surfaces representing access to a computer network (or to magic mirrors and crystal balls) turn the information retrieval process into a mini-game of active exploration at the players choosing. At the same time, IS provide the designer flexibility in how to spatialize the narrative. Disclosure can be locked to a single location and moment, or be made accessible from a set of terminals, subject to logical conditions and temporal constraints, or be made accessible from anywhere at anytime. Allowing the player to actively search and query also permits us to accomodate different levels of interest in backstory, and to scale optional narrative content. Furthermore, a text-based interface is especially intuitive. In the real world, the player is sitting in front of a computer screen, often with a keyboard and mouse - assuming the same pose within the game is intuitive. Of the many systems that Interactive Surfaces make accessible in the game world, computer networks and databases are the most powerful. Compare the DOOM3 PDA with a hypertext accessible in-game, with addtional documents and servers unlocked over the course of events. By specifying a keyword for an in-game search, the player is communicating her current interest and need. The ability to select or type words is a huge step towards effective and precise self-expression, and conversation. Cinematic cut-scenes can disrupt the interactive experience in two ways - they often break continuity by displacing the POV, and they often enforce a hands-off period in which player input is ignored or filtered. DOOM3, in fact, does both. 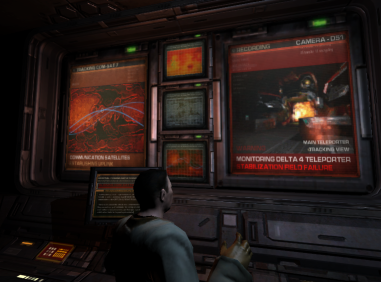 At the same time, DOOM3 places cut-scenes on in-game screens: when the invasion from Hell marks the first dramatic point, we observe it mostly on the display in the old Communication Facility. Just as the eavesdropping on Betrueger and Swann could have been implemented through GUI playback, Hell's invasion of Delta Labs could have been a screen-filling cut-scene. 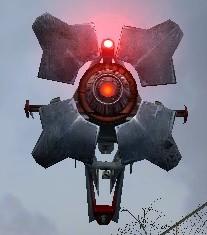 Imagine the player controlling a "Half-Life 2" scanner or other flying camera. Imagine the player using security cameras scattered all over the game space. In each of these situations, the player is reduced to a POV. The game, at runtime, knows the focus of the player, POV and FOV. We can choose to limit and constrain the view: security cameras can be fixed or jammed, access can be time-limited or denied, sweeps might be automated, connection could be intermittent. While the player stares at an Interactive Surface, we are free to show the shadow but not the thing that casts it, make the scanner fail and drop to the floor, let lights flicker and screens go dark, leaving the player with an audio signal and a vague impression. We control the horizontal, we control the vertical. Delivery of cinematic visuals through Interactive Surfaces makes player choice part of the process. Instead of walking into a cut-scene trigger as if it is an out-of-context tripmine, the player can recognize the delivery device, anticipate the delivery, and request it at her own discretion. Skipping a cinematics does not take more than turning away from the display. There is no discontinuity of view, and no need for hands-off, because this type of devlivery allows for repetition. 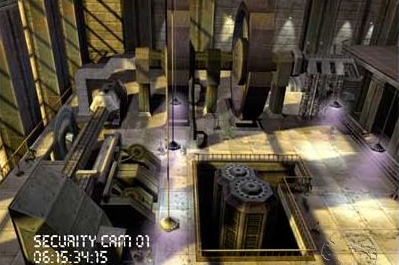 One of the key innovations of "Half-Life 1" where short, scripted events acted out in the players field of view, relying only on player curiosity for their delivery. Some of these cinematic events occupied merely a niche, while others (like the "incident" near the beginning of the game) filled the entire accessible space. The reason that this type of in-game cinematic worked so well was that it was understood as optional content by designer and player. In contrast to "Half-Life 1", "Half-Life 2" sometimes appears to be weighed down by a narrative delivered in lenghty non-discretionary cut-scenes. Locking the player into hands-off replay is an inevitable consequence of delivering essential information through one-shot means of disclosure. 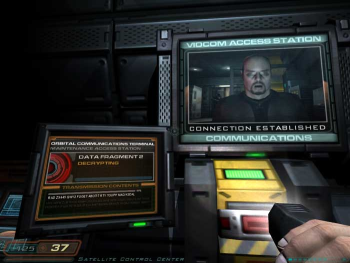 The DOOM3 PDA attempts to work around this problem by letting the player access the information, once delivered, as often as desired - anytime, anywhere. Interactive Surfaces permit us to partition and restrict information: imagine a given camera recording is accessible only at a single terminal. The concept of recordings allows us to hold back on forced delivery: if the player requests a cinematic once through a GUI, why not let her request it as often as desired? If the player does not request the cinematic when the event actually takes place, she can still rewind: a nearby explosion shaking the walls and an alarm flashing on the security monitor might just direct her attention to the visuals we have prepared for her. Hence interactive surfaces permit us to open up content delivery. If essential information is initially ignored, or was misunderstood, the player can still backtrack. Observation of a scripted event through an interactive surface maintains distance - the player is not really "there", and there are no constraints on gameplay preceeding or following the event. Playback of a scripted event adds distance in time: there is no sense of urgency. Note that cinematic delivery can be performed using merely active or reactive surfaces. Interaction is not required. Yet, one restriction of merely active and reactive surfaces is that while the former are oblivious to player attention, the latter can not measure it well. Many of DOOM3's detailed video playbacks on GUI screens might be ignored by a player otherwise occupied or distracted. By giving the player limited POV control and forcing her to steer, an IS can constantly measure whether the player is still engaged and following the cinematic. Interactive Surfaces offer flexibility useful to break up the rigid harness of narrative delivery in games. Using them, we should be able to demonstrate the ability to deliver a fragmented, partially out-of-order narrative with enough flexibility to let the player choose where and when the disclosure is to take place. Rearranging cinematic playback according to player interaction with terminals and remote cameras might not sound as ambitious as Brenda Laurel's "Artifical Playwright", but this one we might actually be able to pull off. Games like System Shock 2 successfully maintain narrative partly (or even primarily) as backstory, instead of burdening the plot involving the player. Myst pioneered an investigative, forensic approach to gameplay and storytelling. 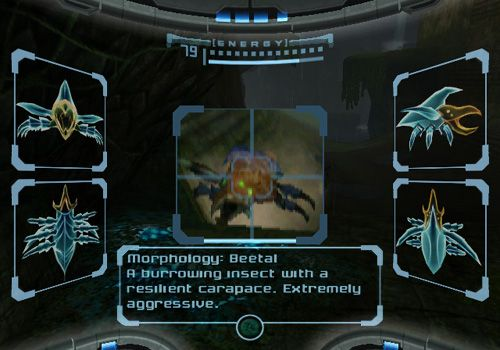 The action game Metroid Prime had elements of forensic storytelling in its design, even if these were mostly limited to performing scans ("collect them all"). Interactive fiction can be implemented as a hypertext accessible from in-game PDAs or terminals, with more and more content resolved and unlocked as the player progresses. There may be hard and tight limits on the amount of information we can intergrate in the plot, but there is no limit on how much elective detail information we want to add to the game's fiction. Figure 2.25. Metroid Prime: scans - collect them all! Security camera deliery, presumably from the POV of the Glukkon CEO of the Splinterz factory, was not in XBox version of the game that fianlyl shipped in 2001.